An enjoyable adventure movie that features fish on a mission at sea and the many challenges they encounter. Finding Nemo is a fun movie. it’s a film about a father and son who get split up and have to spend the movie trying to find and reunite with each other. i suppose it has roots in something like fievel the mouse, where the young immigrant mouse got separated from his family on route to america. but nemo is a little more colorful, energetic, and fun than that movie ever was. and also, it all takes place under the sea. all of pixar’s movies feature humans in one way or another, whether it is the incredibles or up, movies where the main characters are humans, or toy story or a bug’s life, movies where the main characters are much smaller than humans, and where the humans are just occasionally in the background. Finding Nemo belongs to that second category of pixar films. that means that it is able to continue with something that toy story began, which is the picking up of human products and using them for different things, as seen by a creature who has never set eyes on these strange devices before. i suppose this can be traced back even earlier than toy story, to something like the little mermaid with ariel using a fork as a comb, or looking over all of the treasures in her under water collection and wondering what in the world these things could possible be. Finding Nemo is a sort of mix of the little mermaid (a world underwater), and an american tail (the fievel the mouse movie). and it has fun with both it’s setting and it’s plot. 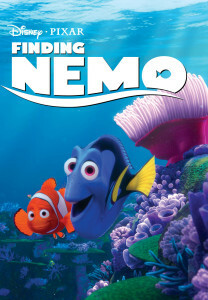 the setting, of course, is the ocean, and even at the very beginning of the movie, before nemo has ever been introduced, characters are making funny quips about the ocean, with albert brooks’ father named marlin, trying to convince his wife to move with him to a new home and joking about the living conditions there. these fast paced jokes are followed by a brutal shark attack, that, like the beginning of up, makes marlin into a widower. his wife is gone, and so are most of his kids, but he does have one left. and that’s nemo. marlin takes care of nemo and raises him and one day is ready to send him off to school. there is a sting ray teacher who carries all the small fish on his back, like a school bus, as he takes them away to where he will be teaching them. but marlin is overprotective of nemo and doesn’t feel comfortable with this, and that makes nemo both angry and embarrassed. the next thing you know, he’s running away, trying to challenge his father and getting kidnapped (caught) by some deep sea divers, and brought up to the surface. 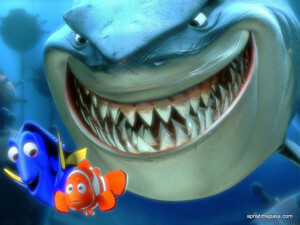 luckily they don’t want to eat nemo, but just to put this exotic fish into the fish tank of a dentist’s office. 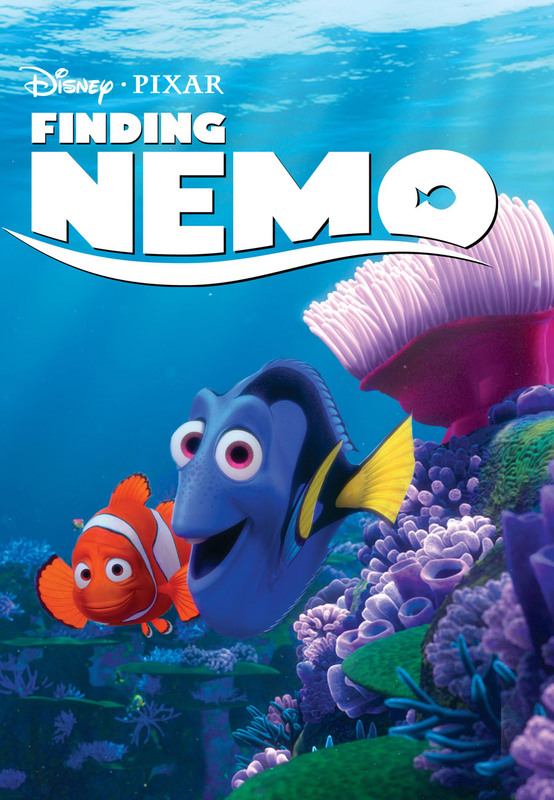 but for poor marlin, he has no idea what has happened to his son and must now go on a mission to try to find out. he goes rocketing through the ocean, searching for clues and comes across a forgetful fish named dory (ellen degeres). dory has short term memory, and so she is probably the worst person to help out as marlin asks questions about whether or not she has seen the divers. and yet, still she manages to go along with him and try to help him find his son. marlin and dory encounter a group of sharks who are like aa addicts trying to cleanse themselves of their sickness. only their sickness is eating fish. they hold meetings where they each bring along a fish friend and declare “fish are friends, not food.” but as soon as that scent of blood gets into the water, you can bet these sharks aren’t going to be so friendly. we get a cool action and chase scene out of that one. there are other cool adventures and challenges along the way, including riding on the back of a sea turtle and going through a group of jelly fish that is like an area of land covered in explosives mines. the jellyfish sting, but only if you touch their tentacles, so be careful. marlin and dory have to help each other out with many of these obstacles and they become a good team, working together. meanwhile, nemo has been brought to this dentist’s office and meets the other fish in the tank (led by creepy-voiced willem dafoe.) the dentist has a little daughter who he plans to give nemo to and she resembles sid, the destructive boy from toy story who lived next door to andy and had a reputation among the toys. similarly this girl has braces on her mouth, making her talking very hard to understand, and is known by the fish to be an accidental killer of sea creatures. nemo and the fish in the tank plan an escape route including swimming into vents and jamming propellers. it’s like mission impossible type stuff, without going so far as to really spoof that movie. good choice. instead, we get the exciting escape routine going on inside the office while marlin and dory are scaling the sea looking for nemo outside the dentist’s window. the whole thing is a lot of fun. like the little mermaid, it is smart of the screenwriter to set a solid portion of the movie on land, instead of keeping it all at sea. switching it up gives us that feel of watching something fresh and creative. it also brings human characters into it more, even if they are just reserved for the background. these humans represent the villains of the movie, and that’s fine. a good movie needs a villain or two. and like all pixar and disney movies, there are plenty of deep, psychological ideas for the adults mixed in here too. most of them involve marlin’s problems of being too over protective and dory’s problems of what she does and doesn’t remember and why. there’s a lot going on here, and it’s a smart, crafty, and lively movie.